Out of fairness, I’ll mention yaourt today. I know there are a lot of add-ons and frontends to the venerable pacman, but I’m a yaourt user for a couple of simple reasons. The first is color. No, just kidding. 😉 The first is congruency: With very few exceptions that I know of, yaourt is almost command-for-command a match with pacman. Of course there are a few embellishments here and there, but I haven’t found anything yet that makes one or the other terrifically uncomfortable. The second is transparency: What I really want as a bump up from pacman, is the ability to mesh cleanly with the AUR for searches and installation. I’m comfortable at this point in my Linux experience with installing “unsupported” software in Arch, and I’m generally clever enough to spot a malformed PKGBUILD and kick it into a working state. The only thing pacman lacks is the ability (permission?) to continue its searches and installs with the AUR. But that’s enough about that. 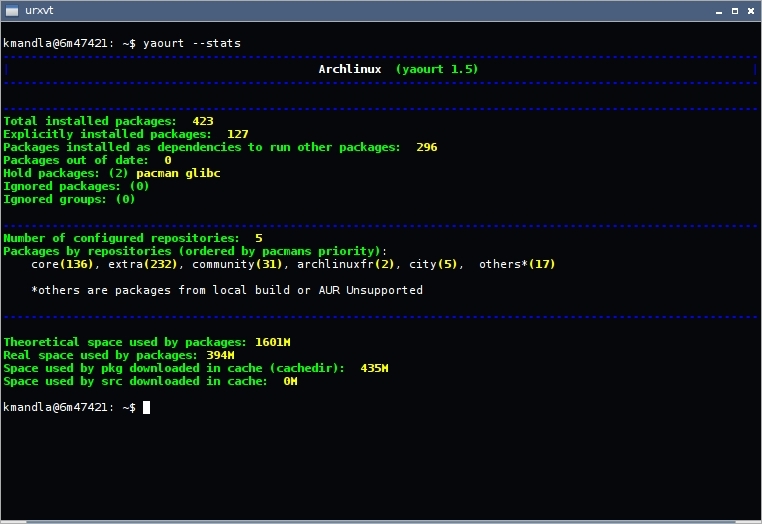 I think using yaourt puts me into a minority of Arch users. But it’s hard to tell because there are quite a few tools that embellish or boost pacman, and I know of no survey that sets us all into our individual camps. This entry was posted in Linux and tagged management, package on 2014/09/27 by K.Mandla. interesting. i thought for sure you’d have been a packer fan before yaourt. far from being tech-savvy, i think it has never caused me any harm, as so often outlined by the purists. i even ran “yaourt –sucre” several times without any problems! i’m with you an all points here. it would be interesting to see some more yaourt users come out.